LISLE, IL – November 14, 2016 – Nallatech, a Molex company, will showcase FPGA solutions for high-performance computing (HPC), network acceleration and data analytics at the Supercomputing 2016 (SC16) Conference and Exhibition, November 14-17 in Salt Lake City. A demonstration at the Nallatech booth 2214 will showcase FPGA acceleration of Convolutional Neural Networks (CNN) object classification by using a low profile Nallatech 385A™ PCIe accelerator card with a discrete Intel Arria 10 FPGA accelerator programmed using Intel’s OpenCL Software Development Kit. Built on the BVLC Caffe deep learning framework, an FPGA interface and IP accelerate processing intensive components of the algorithm. Nallatech IP is capable of processing an image through the AlexNet neural network in nine milliseconds. The Arria10-based 385A™ board has the capacity to process six CNN images in parallel allowing classification of 660 images per second. 385A™ FPGA Accelerator Card — A low profile, server-qualified FPGA card capable of accelerating energy-efficient datacenter applications. Two independent banks of SDRAM memory and two optical network ports complete the balanced architecture capable of both co-processing and latency-critical 1G/10G/40G streaming applications. 385A-SoC™ System on Chip FPGA Accelerator Card – A powerful computing and I/O platform for SoC FPGA and ARM-based development and deployment across a range of application areas including HPC, image processing and network analytics. The 385A-SoC™ is capable of being used in “stand-alone” mode running Linux and software stacks on the embedded ARM processors allowing the accelerator to be used without a host server for ultimate Size, Weight and Power (SWAP) performance. 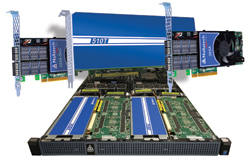 510T™ Compute Acceleration Card – FPGA co-processor designed to deliver ultimate performance per watt for compute-intensive datacenter applications. A GPU-sized 16-lane PCIe Gen 3 card, the 510T™ features two Intel Arria 10 FPGAs delivering up to sixteen times the performance of the previous generation. Applications can achieve a total sustained performance of up to 3 TFlops. The 510T™ card is available with almost 300GByte/sec of peak external memory bandwidth configured as eight independent banks of DDR4. This combination, plus the FPGA’s on-chip memory bandwidth of 14.4TBytes/sec, permits dramatic new levels of performance per watt for memory-bound applications. Nallatech® FPGA Accelerated Compute Node® – Develop and deploy quickly with minimal risk using a Nallatech FPGA accelerator, tools and IP delivered pre-integrated in a server of your choice. Nallatech, a Molex company, is a leading supplier of accelerated computing solutions. Nallatech has deployed several of the world’s largest FPGA hybrid compute clusters, and is focused on delivering scalable solutions that deliver high performance per watt, per dollar. www.nallatech.com.